HOT102’s History – HOT102, Milwaukee's Party Station for Old School! 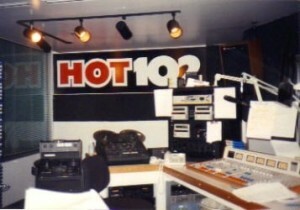 The HOT102 studios high above Mayfair Mall in 1993. HOT102 (aka “the HOT FM”, “LOVE 102″, and some other incarnations) was a Top 40 and R&B music station in Milwaukee from 1979 to 1994, broadcasting at 102.1 FM with the call letters WLUM. It was owned by Green Bay Packers great Willie Davis as part of his company All-Pro Broadcasting. The station acquiesced to a changing music market and competition during the surge of “grunge” and the station flipped to Alternative as FM 102-1, which continues today. A bumper sticker from 1986. Hey, we like FM 102-1, but we missed the “old school” HOT102. There are only so many available slots on an FM dial, so we went to the Internet and re-created HOT102 online. Armed with some the original jingles, voice guys, the music, and (hopefully) the “vibe”, HOT102 went alive once again! Plenty of great personalities have come through the studios of HOT102. We hope to have some DJing again on the station for you if and when we come back… we already have new mixes from Fresh G! Listen for them on Friday/Saturday nights. Times change, but great music and great radio are timeless. Here’s some fun, original HOT102 stuff from back in the day! Technology is great, isn’t it?? I have been talking with my friends and sister if anyone remembered the “pee pee dance” song. I really never had the time to search for it until now. I am extatic that I found you guys and the video again. Such a large part of my growing up listening to this station….Loved it!! Thanks!! Hey Michael, sorry for the long, looooong delay in responding. Love that you found the “Go Pee Pee” video here! We’ve re-upped our royalty license and some other things, so stream us all you want here on HOT102Radio.com or look us up on TuneIn, search for “HOT102”. And we welcome feedback and requests! Hey! Remember these jingles that TM Century did? Hey Jammin’ Vern B! Yep, we got ’em. Check out the stream!